A Paper Garden: Talking stamps?? Do you ever find a stamp that just kind of speaks to you? Anyone who reads this blog regularly (Hi again Mom!) knows about my attachment to the justjohanna stamp Belle. (if not you can read about it HERE). Well, I discovered another one that just jumped off the page for me. 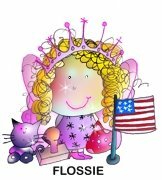 This is Miss Prissy Montgomery from Eat Cake Graphics. 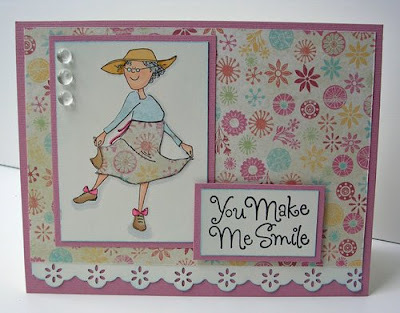 She is one of the 4 stamps in the Sassy Seniors card kit - and I just love her! I see a woman who has lived her life on her own terms, is not worried about what others think and is blissfully happy as a result. How I get all of that out of one image - I have no idea. Maybe its wishful thinking - but she really does make me smile. I want to be her when I grow up. All of the papers and embellishments are in the Sassy Seniors kit. I added the lace at the bottom by punching a strip of white cardstock with the Lacy Days of Summer Punch. The sentiment is from the Anytime Sentiments clear set form Impression Obsession. It really is a great collection of sayings. Since I paper pieced Walter yesterday - I decided to paper piece Miss Montgomery too - so she could have a nice flowered skirt. The shirt is the reverse side of the double sided paper. I'm in love with the Quickie Glue pen for doing paper piecing. Just a reminder, only 3 more days to get $4 flat rate shipping at the Paper Garden Projects store! This is too cute! I love that grandma stamp and the paper's gorgeous too. this card is great, love that image and checked out the kit it is great. Awww that old lady is so cute. I hope when I become a "senior", I'll be happy and smiling (and be able to twirl) like that lady! LOL! Your card is fabulous! Great job! Oh I love her! and I love your card! Great card and that stamp is just adorable. I like the sentiment also. Obviously, I need to check out some new stamps. Sigh. she's a doll....looks like a fun lady!! Fun colors and details! !